Although this burger was superior, it really wasn’t necessary to grind up the salmon and dilute it with egg and breadcrumbs. Next time, it’ll just be the salmon fillet with these awesome accouterments! I’ll have you know that I have been nagging Kevin, on a regular basis, to get us a posto for Foodo. He always says, enthusiastically, “YES!”. But this girl knows better! I just like to hear, in his voice, that he’s thinking about it and would like to. OR is it that he’s just telling me what I want to hear……hmmmm. Anyway, the last time I nagged him, it was for a salmon burger for our extravaganza (he being the expert and all). He said “Absolutely NOT”, that their salmon was far to good to waste on a silly burger. I’d have to concur and reiterate myself: just use these ingredients on a salmon fillet (heck you could even put the fillet on a bun) and have yourself a SIMPLE meal instead of one with all this fuss. Heat over medium-low in a non-reactive sauce pan until slightly thickened. Set aside. Mix with hands gently. Divide into 4-6 equal patties. Grill over medium heat. If the patty seems loose to you, you may want to grill them on a perforated grill topper. 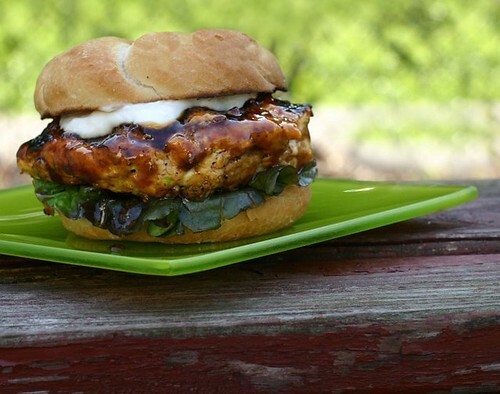 It’s tricky bbqing salmon burgers you DO NOT want to over-cook them. After about 3 minutes carefully flip them, brush with the glaze and cook for another 4-5 minutes until they are opaque throughout. Serve on a Toasted Bun of choice with Lettuce or Sliced Cucumbers, or both. Top them with more glaze and the Aioli. and I just got done eating now I am hungry again! awesome !! I second, or third, the using of just the salmon fillet– woohoo, looks so fabulous! But I like the idea of using the mint. I’d place the freshly washed leaved on the fillet (like lettuce). Gorgeous. I’m not much of a salmon fan, but this would work with other things, no? So good, salmon is my fav…recently prepared a salmon burger and they are so versitile with so many yummy options for preparation:) Looks so good! Your post make me crave a real barbeque a warm, sunny afternoon in California. Mm! It looks and sounds AMAZING. Great picture. Very savory… Salmon is my favourite. Nice, Mary. I don’t do beef, but I sure could go for a burger like this one. And I think we have some salmon around here somewhere! Cheers! This looks great! I love sandwiches that are a little bit alternative! I have never tried making salmon burger at home. Till now I have been getting those frozen patties from costco and going crazy. Well this is the recipe I was waiting for I suppose. This recipe looks absolutely delightful! I can’t wait to give them a try. I love your blog’s name as well. Cute! Why thank you kind Miss!